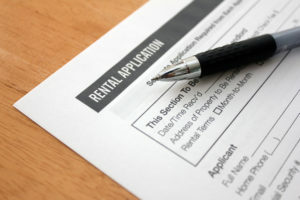 What’s the application process and screening criteria for a rental application? Apartment searching can be stressful. Even after spending all that time and energy searching for the perfect apartment, there is still the question of if the landlord will choose you out of all the other applicants. This brings us to the topic of the rental application process. What it is and what screening criteria are required for a rental application. The application process is a landlord’s way of screening for the most-qualified and least-risky future tenant. As a landlord, the last thing they want is for a tenant to miss payments on rent, mess up the apartment, and/or cause a disruption in the community that they would then have to deal with. By looking at your background and finances, a landlord can have a better idea of what kind of tenant you’ll be and also if you’ll be able to pay rent on time each month. Often, landlords may have a management company or real estate agent work on the screening process for them. As a renter, there are a lot of different documents to prepare, forms to fill out, and fees to pay, so it’s best to begin collecting necessary documents and putting aside enough money in a bank account prior to the start of your apartment search. Application fee: The landlord may require each person on the application to pay this fee. This fee covers the processing of the application. Credit Check Authorization Fee: Landlords will commonly run a credit check on each person on the application. This fee covers fee that landlords will have to pay in order to run a credit check. “Good-Faith deposit”: Some landlords will ask applicants to submit a deposit to temporarily take the apartment you are interested off the market. You should be able to receive your deposit back if your application is denied by the landlord. Beware: Never hand over your personal information or submit any fees to the landlord or agent until you have seen the apartment you want in person. This is the best way to protect yourself against scammers. So what are some important criteria’s a landlord may consider? A high enough credit score: A credit score is a good representation of your financial responsibility. The better your ability to pay off your loans and pay your bills on time, the higher your credit score. A credit score is generally a number between 300 and 850. As implied, the higher your score, the better. If your credit score is lower, your landlord may require that you pay a few months rent upfront or a larger security deposit so they can minimize the chances of you not paying rent on time. Federal law stipulates that you are allowed to get a free copy of your credit report every year from each credit reporting company. You should be checking this yearly to ensure that your information is correct and up-to-date. A great resource is http://annualcreditreport.com. Sufficient income: Outside of your credit score, landlords will also need to be sure that you are making sufficient income so that you can afford rent on a monthly basis. If you do not make enough to cover rent, you should consider getting a guarantor. Stable employment history: This kind of goes hand-in-hand with having sufficient income, but having a stable employment history, implies that there is a less likely chance that you will run out of income to pay rent. Clean eviction record: Landlords will often check for your eviction record. A clean record implies that other landlords haven’t had issues with you and the more you will be viewed as a good potential tenant. Reference letters: Outside of your finances, landlords will also view applicants with great reference letters in a favorable light. So if you can attain great reference letters from your employee, past landlord, or guarantor, that should add some extra oomph to your application! Can You Negotiate Your Rent In Manhattan? Inside Tips for Finding No Fee Listings in New York. Getting a New Lease during the Summer – Tips and Pointers!